All of our websites are based on WordPress- a popular Content Management System. It is also an industry standard platform used by 60 million websites worldwide. We use the highest quality themes and customize them for your business. You get full access to the same powerful (CMS) that was used to build your website so you can make your own changes after the website is complete. All of the websites we design are fully responsive. That means that they automatically adapt to displays on mobile devices, tablets and desktop PCs. This gives the visitor the best possible experience by displaying your content in an easily readable format, no matter what they are using to view your site. This website is an example of a responsive design. Try viewing it on various devices, or if you are using a desktop PC resize the window smaller and smaller to simulate the smaller screen of a mobile device. Your website will respond fluidly just as this one does! We make it easy for you to have an attractive, effective website for your business. You supply the text and pictures, and we do all the rest. It’s as easy as 1 – 2 – 3. Contact Us for a free phone consultation. We will discuss the style, general color scheme, how many pages your website will have, the pictures, and other details. You make an initial payment (the amount varies). If your website will have a new domain name, we immediately register it in your name. Then, based on your preferences, we create a mockup of your home page. This is uploaded to the Internet so that you can view it. After you approve the mockup, we complete all of the remaining pages. You review the fully functioning website. We make minor changes if necessary, and the website goes live. The entire process can usually be completed in just a few days! 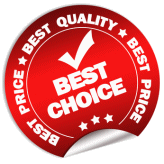 For information on pricing, please see our pricing page. There are no ongoing maintenance fees. You pay us nothing after your new web design is finished unless you need to have changes made. Let’s get started! Contact Us for a free no obligation consultation. We will be happy to answer your questions. A professional web design for your small business will increase foot traffic to your store. Create an online store and increase your sales. Over 90% of Americans search for professionals on the Internet. A professional web design makes it easier for customers to find and do business with you.